Its an age of meeting less chatting more, be it whatsapp , gtalk , facebook or the occasional email. The Guitar girl is mostly written as chats , sms , journals and emails. It is anusing to note that indeed all these modes cover the life story of so many people around us. 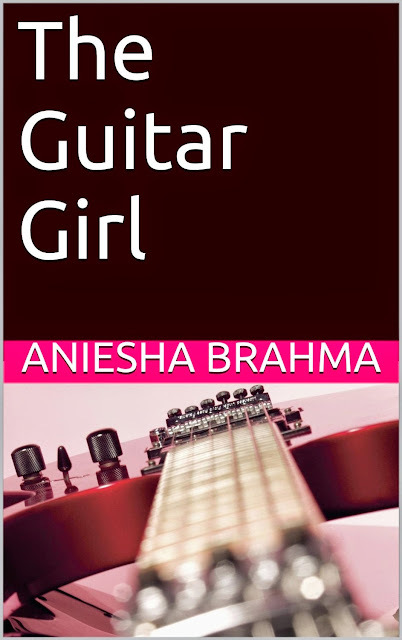 Guitar girl is the blog name taken up by Rhea to anonymously write songs about her love for Joy who happens to be her brother's best friend. He is the reason that she picks up the guitar again and makes a sincere effort to learn in order to have some connect with Joy who is a musician himself. Then there is Sophie and Arjav , Rhea's best friends , Arjav's elder brother who is the girl's tution teacher too and some other characters who add a little spice to the plot. The style of writing is casual and fun and almost like any chat conversation would sound. Though given Rhea and Joy's age , the story might need an initial convincing to do for the reader , it takes off quite well after that. I see so many couples around me who think their love life is most troubled and its the end of world and yet there is so much learning this phase brings to them. Though I am much older to experience that I do laugh at such memories from my life. This book made me laug and smile at many places and was a good happy read for the day. Every character has its own shades of grey but it is endearing too. It is good to see how everyone is related to each other's stories. The book almost touches on all scenes and issues that modern teenage faces these days and does a good job. The writing pattern might put off a few readers and ones who do not enjoy teenage in love sort of stories should give it a try with an open mind.